Prayer to the Almighty Puzzle Master | amen and ehmen! Writer’s Note: This is an excerpt from my personal God Journals written several years ago as I was going through a particularly rough patch. Things were changing in my life, some painful, some confusing and all of which would turn out to be the beginning of a whole new journey for me, an exciting journey that has brought me to this place at this time, a place in which I live and breath closer to God than I ever imagined was possible. Never give up on God, my friends, because He never gives up on you! This I can promise. Hey, God, it’s me again. It’s 5:11 in the morning and though I’m concerned about not getting enough sleep, I felt the nudging of the Holy Spirit that I should go get my computer and write a little this early morn. I had prayed last night for the Holy Spirit to come upon me and inspire my writing so that I am writing what you need me to write. So here I am. When I look back on my life at the difficult times, I can always find positive things that came out of the hardships I faced. All believers can do this, if they truly have faith and trust in You. That faith and trust is what allows us to give up dwelling on the negative and firmly grasp the positive. It has been my faith and trust in You that has gotten me through this most difficult year. 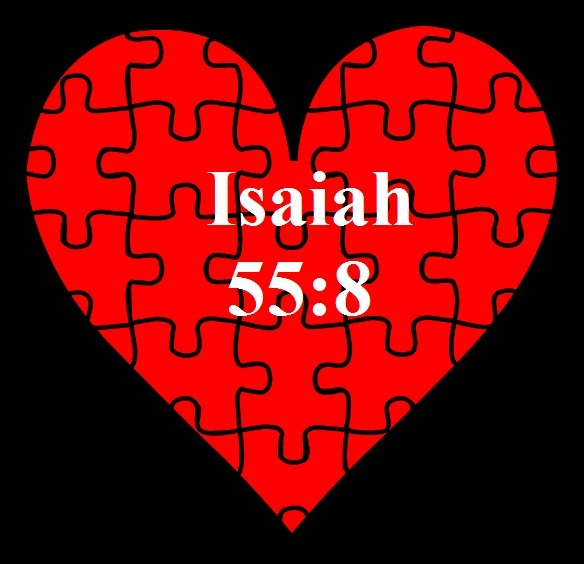 And, though, I am still in the midst of trials and tribulations, I can actually see Your masterful and powerful hand moving throughout my life, shifting the puzzle pieces around, snapping them in place, one at the time. It’s my faith—my ability to see the puzzle picture of my life slowly coming together—that keeps me going. I’m finally learning that we can’t just grab puzzle pieces from anywhere and try to force fit them into our lives, because if You didn’t put those pieces in our puzzle box, they’re simply never going to fit. And, who wants a puzzle that doesn’t fit together? No, I don’t want to create my own picture anymore. I want You, the Creator of the universe, to be my artist, because I know that Your picture for my life is better than anything I can possibly come up with on my own. Indeed, the sooner I give You full reign and complete creative license over my life, the sooner my picture will emerge as the true work of art, the truly purposeful life I was created for. God, I wholeheartedly, give it all to you. Right now. Take me and take my talent, work through me. I only want to write your words, words that please you, words everlasting. Thank you for giving me these gifts. I commit them all to you. Isaiah 14:24: The LORD Almighty has sworn, “Surely, as I have planned, so it will be, and as I have purposed, so it will happen. Romans 8:28: And we know that in all things God works for the good of those who love him, who have been called according to his purpose. Yup every morning I rush to the computer to read my new Devotional. Thank you Brenden.